On the 26th (Wed), trot along with a tour on horseback. Get ready for a full day of sightseeing on the next day: relax and rejuvenate at some of the top local wellness centers, then admire the striking features of Fabrica La Aurora, then contemplate in the serene atmosphere at Parroquia de San Miguel Arcangel, and finally look for gifts at Maria Belen Nilson Jewelry Design. To find where to stay, ratings, other places to visit, and more tourist information, use the San Miguel de Allende trip itinerary maker. Mexico City to San Miguel de Allende is an approximately 3.5-hour car ride. You can also do a combination of flight and bus; or take a bus. Traveling from Mexico City in April, you will find days in San Miguel de Allende are a bit warmer (86°F), and nights are about the same (52°F). Wrap up your sightseeing on the 28th (Fri) early enough to travel to Puerto Vallarta. Start off your visit on the 28th (Fri): push the limits with an extreme tour. On your second day here, take a leisurely stroll along Puerto Vallarta's El Malecon Boardwalk, then make a trip to The Church of Our Lady of Guadalupe, and then get up close to creatures of the deep with a dolphin and whale watching tour. To find where to stay, more things to do, maps, and more tourist information, refer to the Puerto Vallarta trip itinerary planner. Traveling by combination of bus and flight from San Miguel de Allende to Puerto Vallarta takes 5 hours. Alternatively, you can drive; or take a bus. Plan for a bit warmer nights when traveling from San Miguel de Allende in April since evenings lows in Puerto Vallarta dip to 66°F. 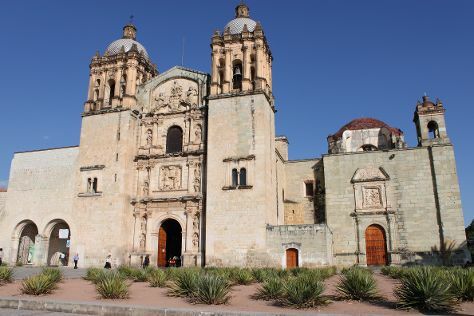 Wrap up your sightseeing on the 30th (Sun) early enough to travel to Oaxaca. Kick off your visit on the 30th (Sun): admire all the interesting features of Instituto Amigos del Sol, then contemplate in the serene atmosphere at Monte Alban, then contemplate in the serene atmosphere at Basilica de la Soledad, and finally examine the collection at Museo de las Culturas de Oaxaca. On the 1st (Mon), you'll have a packed day of sightseeing: don't miss a visit to Zocalo, take in the spiritual surroundings of Templo de Santo Domingo de Guzman, then look for gifts at Silvia Suarez, and finally admire the natural beauty at Ethnobotanical Garden. To see reviews, where to stay, maps, and other tourist information, read our Oaxaca trip itinerary builder. Traveling by flight from Puerto Vallarta to Oaxaca takes 5 hours. Alternatively, you can drive; or do a combination of bus and shuttle. When traveling from Puerto Vallarta in April, plan for a bit warmer days and little chillier nights in Oaxaca: temperatures range from 91°F by day to 57°F at night. Finish your sightseeing early on the 1st (Mon) so you can travel to Mexico City. You'll find plenty of places to visit near Mexico City: Cuernavaca (ASLI-Spanish Language Institute & Robert Brady Museum), San Juan Teotihuacan (Zona Arqueologica Teotihuacan & Pyramid of the Sun) and Galeria Media Luna (in San Martin de las Piramides). The adventure continues: examine the collection at National Museum of Anthropology (Museo Nacional de Antropologia), get to know the fascinating history of Historic Center (Centro Historico), get a sense of history and politics at National Palace (Palacio Nacional), and make a trip to Zocalo. To find where to stay, reviews, maps, and other tourist information, read Mexico City itinerary maker. Getting from Oaxaca to Mexico City by flight takes about 3 hours. Other options: drive; or take a shuttle. While traveling from Oaxaca, expect little chillier days and about the same nights in Mexico City, ranging from highs of 79°F to lows of 56°F. Finish up your sightseeing early on the 9th (Tue) so you can travel back home.